Stoic today announced that after less than 7 days they have reached the initial $200,000 target for the Banner Saga 3 on Kickstarter. The crowdfunding campaign for the third installment of the turn based strategy series, has now unlocked it’s first stretch goal, with the introduction of playable Dredge if the campaign hits $250,000. Further stretch goals will be revealed as the campaign progresses. In Banner Saga 3, players will embark on their final journey beyond the wall of Darkness. The hand drawn Viking role-playing adventure will once again test the players through tactical battles against deadly adversaries where a player's choice directly affects their personal journey. 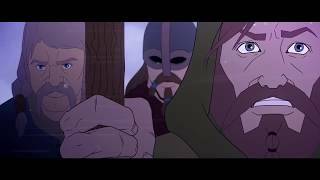 The Banner Saga 3 is in development for PC, but console versions are also expected. The Banner Saga 3 is ranked #313 out of 1434 total reviewed games. It is ranked #9 out of 146 games reviewed in 2018.